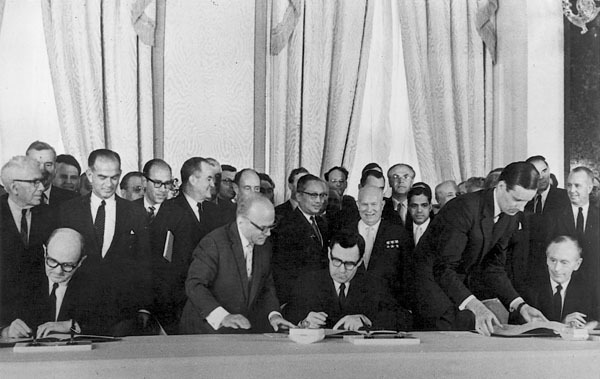 In the presence of Soviet Premier Nikita Khrushchev, foreign ministers sign the Limited Test Ban Treaty. Seated are, from left, Secretary of State Dean Rusk, Foreign Minister Andrei Gromyko, and Foreign Minister Alec Douglas-Home. Standing behind Rusk are Senator George Aiken (R-Vt), Senate Foreign Relations Committee Chairman J. William Fulbright (D-Ark), State Department interpreter Alexander Akalovsky, Senator Hubert Humphrey (D-Mn), and U.S. Ambassador to the United Nations Adlai Stevenson (eyes and forehead showing only). Standing immediately behind Gromyko are United Nations Secretary General U Thant and Khrushchev. To the right of Khrushchev and standing at the wall (near the curtain) is Soviet Ambassador to the United States Anatoly Dobrynin.